There are two aspects of water storage and treatment: sanitizing and purifying. Sanitizing is the killing of microbes, cysts, algae etc. Purifying is typically filtering out all the microbes etc. You can drink the foulest looking water as long as you have killed the dangerous stuff, or you can filter out the dangerous stuff. We personally do both. We sanitize our stored water to keep it from festering and growing everything from algae and mosquitoes to dangerous microbes. Then we filter the water as we take it out of storage to actually use, using our Sawyer PointONE filter. We get our water from a variety of sources; rain collection, well, and spring. The purity of this water can be of question. For example, we know for a fact that the spring we use tests positive for e coli. Even if the water were perfect, sitting around in storage, especially in sunlight, can encourage nasty things to grow in the water. There are two known treatments to kill off microbes etc. in your water and keep it safe: Sodium dichloro-s-triazinetrione Dihydrate or Calcium Hypochlorite. Of the two, Sodium dichloro-s-triazinetrione Dihydrate is the preferred, and is EPA registered and NSF/ANSI certified for routine chlorination of drinking water. NOTE: From my reading, Sodium dichloro-s-triazinetrione Dihydrate is the same as Sodium dichloro-s-triazinetrioneHydrated. Over the years many people have used common household bleach for this purpose. We are going to try and convince you NOT to use this. Household bleach can be based upon a number of different chemicals, and of those none use Sodium dichloro-s-triazinetrione Dihydrate. Some use Calcium Hypochlorite, but many don't. And you typically will not find a label listing the contents. In its liquid form, the 'chlorine' that is dissolved into common household bleach will evaporate in 6 to 12 months, leaving you with a bottle of basically water. Even if you avoid household bleach with fragrances and other additives, your basic bleach still contains other chemicals that do nothing for purifying your water. So, what should you use? Why 99% Sodium dichloro-s-triazinetrione Dihydrate of course! 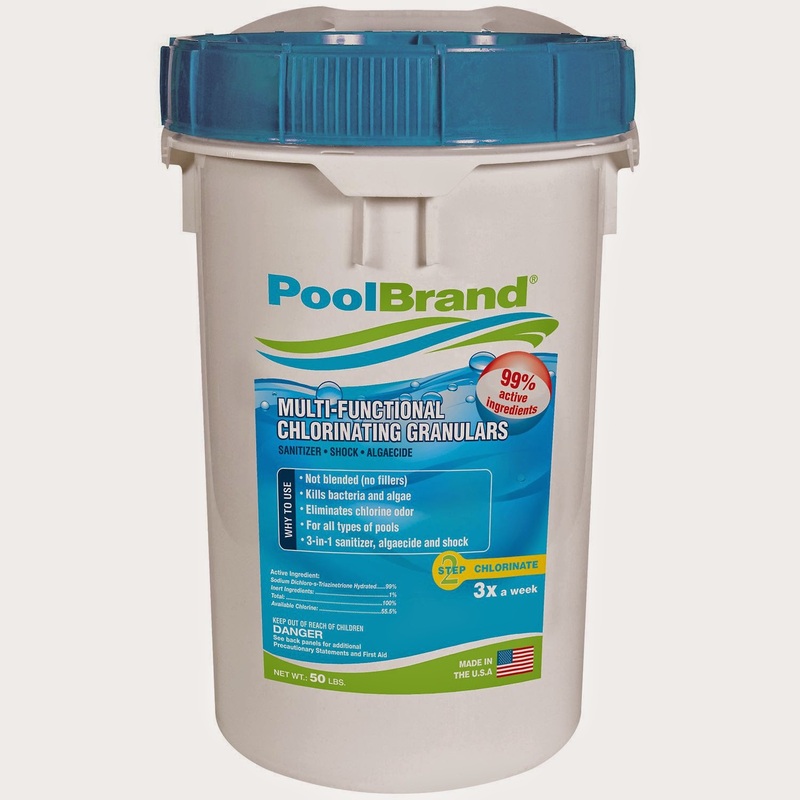 After much looking, we found "Small Pool Sanitizer", sold in 2 pound containers, enough to typically treat 150,000 gallons of water. We have also found 50 pound buckets of Sodium dichloro-s-triazinetrioneHydrated granules, enough for 4 million gallons of treatment. Be careful of using treatments found in most pool supply store sections intended for full size pools, as they often contain many other chemicals and are not just 99% Sodium dichloro-s-triazinetrione Dihydrate. And the 'tablets' or other 'slow release' products won't work in this application. Use 1 teaspoon of the granules per 200 gallons of water; for example 1 and a half teaspoons is right for a full 250 gallon IBC tank. A quarter teaspoon for a 55 gallon rain barrel. As this product is in granular form, its shelf life is extremely long if kept tightly sealed and dry. To use, WEARING SAFETY GLASSES, measure the granules into a small container (we use a 1 quart plastic milk jug), half fill with water, tightly cap and shake until dissolved. Then pour your concentrate into the water tank and swirl with a stick. After a few hours (or over night) take a sample and smell it. If there is even the slightest smell of chlorine, then it has done its work and you are finished! If there is no scent, then do a second treatment at a lower concentrate, perhaps half strength. Repeat, giving a few hours between doses, until you can smell a bit of chlorine. You can also use these pool test kits (only checking for chlorine - yellow test), and even the slightest trace of chlorine is good! The chlorine gets used up as its kills the bad stuff. Any residual smell (or positive from a test kit) means it finished its job and had a bit left over. It is important to remember that unless you seal off your stored water and keep it in a cool dark place, it will occasionally need to be retreated. We retreat the IBCs we use for rain water collection after new rainwater is added, and even between rainstorms we keep an eye on it. First signs of algae growth is a good indicator that re-treatment is needed. While either Sodium dichloro-s-triazinetrione Dihydrate (a.k.a. Sodium dichloro-s-triazinetrione Hydrated) and Calcium Hypochlorite can be used for water sanitation, they MUST NEVER BE MIXED! These two chemicals when mixed can become violently explosive, and the resulting chlorine deadly, or causing grievous bodily injury. It is best to use one or the other, and never store both. Hello Allan - Thank you for sharing so much useful advice. I am really enjoying it. Here in ""sunny Texas" rainwater is treasured. I worked for a company which ran 100% on rainwater. They used ultra-violet light for disinfection. Do you have an idea of how that compares to the swimming pool chemicals? Thank you thank you thank you! We have had SO many issues with our drinking water (our well has a lot of sulfur), and bleach evaporating, and I could not find much help online as to what to do. You solved this! Thanks again!